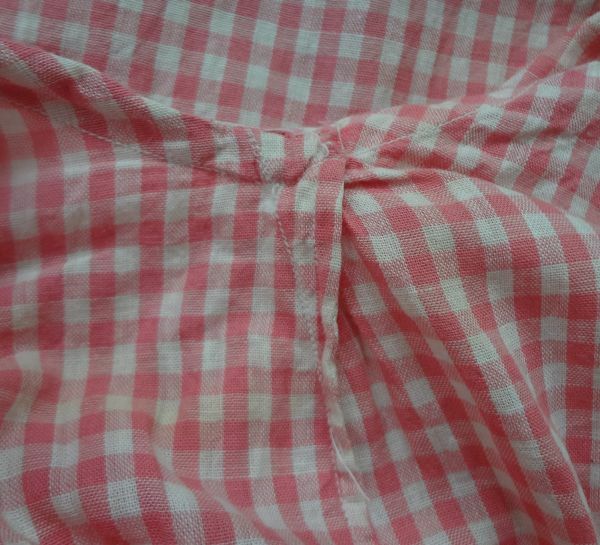 About a year ago I went on a rant over how some vintage clothing sellers and buyers have changed the vocabulary of certain garments in order to made them seem more versatile. In particular I was irritated about the use of the word “romper” when the object in question was obviously a gym suit or a bathing suit. I even went so far as to say that women did not wear rompers, that the romper is a garment for a baby or a toddler. I never like being wrong, but when I am it pleases me that my fellow fashion history lovers care enough to set me straight. After posting the rant I got an email from Lynne (otherwise known as the best online researcher I know) that contained a 1920s sewing pattern for a woman that was clearly labeled a romper. 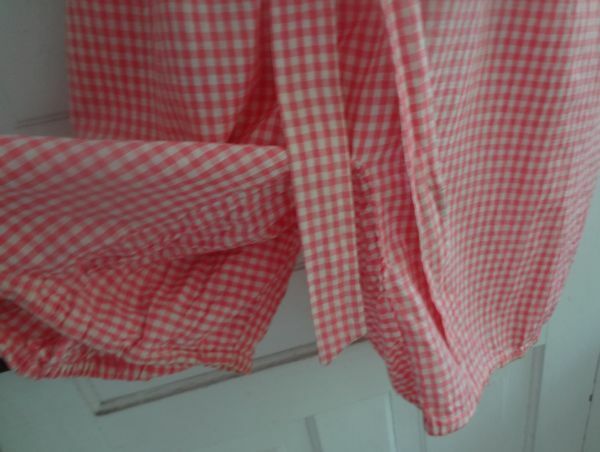 She also sent along a photo of a very similar garment she has in her own collection. Properly corrected, I then set off to find an example for my collection. Last week I finally was able to add the one seen above. There is no doubt this is a garment for an adult, and it is also apparent that this is an outer garment, not lingerie. Notice that there are snap closures on both shoulders and another on the front of the neck. This made it easy for the wearer to put on the romper by stepping into it and pulling it up. The tie belt sits on the top of the hips, giving a proper 1920s silhouette. The inside legs and the crotch are shaped with the use of a wide gusset. There is elastic in the legs, but it is old, crunchy, and it no longer stretches. I’ll not replace it, but if this ever goes on display some new elastic can be inserted along side the old. The shoulders have those handy little lingerie strap holders that prevented that embarrassing bra strap slip-up. I’m quite sure this romper was made at home rather than purchased. 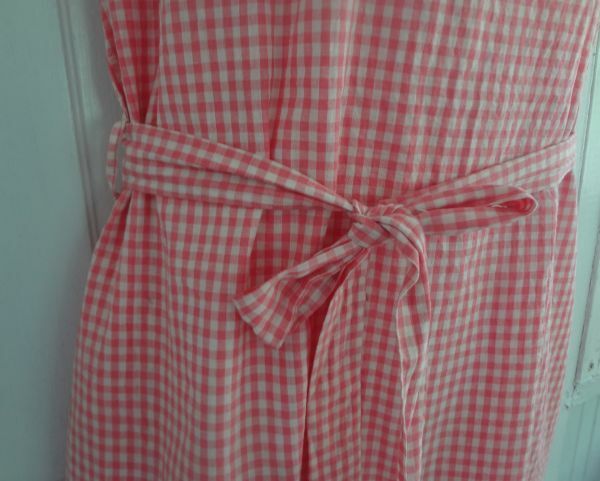 The construction is very good, but there are a few places where alterations were made while the garment was being made. 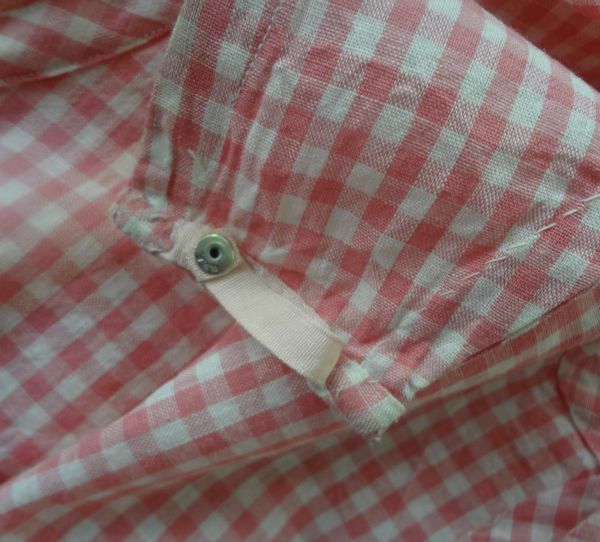 There is also quite a bit of hand-stitching. I tried to locate the photos Lynne sent to me, but failed. 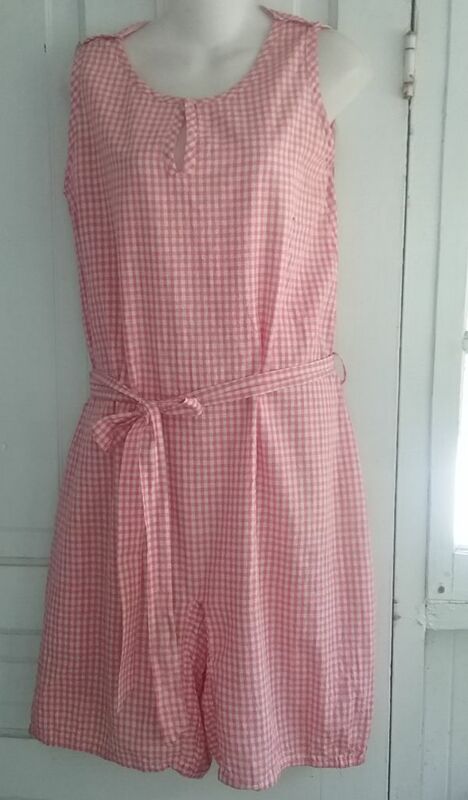 I did find an example of a Butterick sewing pattern for a romper in a post at Witness2Fashion. 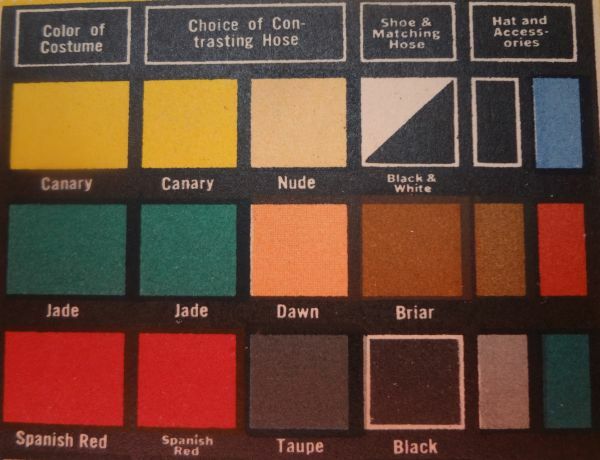 It was included in a feature of costume party patterns. 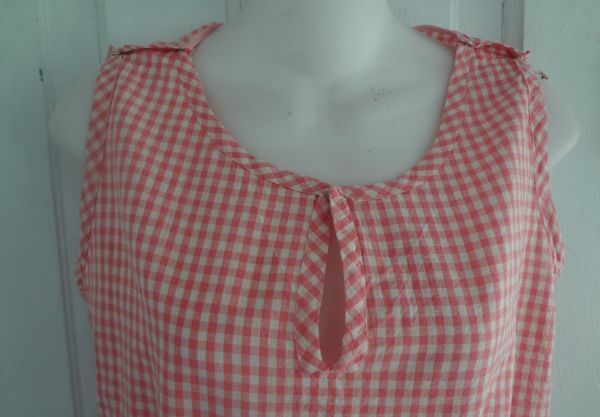 I located another, very similar one from McCall Patterns. So rompers definitely were a thing for women, at least in the 1920s and 1930s. Still, I don’t agree with calling a gym suit a romper, no matter how much the garment is similar. In fact, my romper here looks to be a direct descendant of my circa 1915 gym suit. 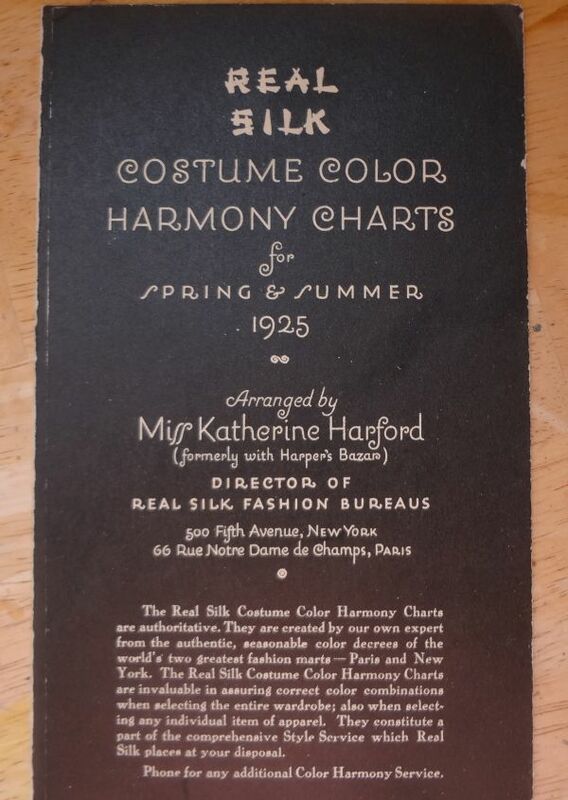 The color consultant and fashion director at Real Silk was Miss Katherine Harford. As you can see, she was formerly with Harper’s Bazar, but it does not tell us what her job there was. The only references I could find to Miss Harford were in Real Silk ads. Unfortunately it appears that one/third of this folder is missing. In other examples I’ve found there was another section labeled “Street”. 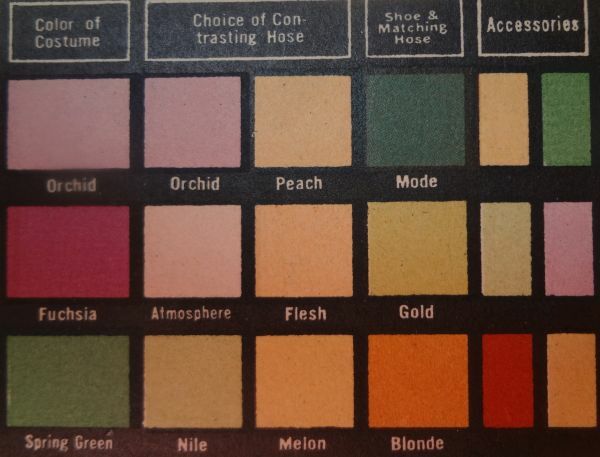 Still, there is enough here to give us a good idea of fashionable colors in 1925. In today’s anything goes world women might find the advice of how to match costume, hose, shoes and accessories to be a bit quaint. But in 1925, the showing off of one’s legs was a big deal, one that many women were still unaccustomed to doing. Of course, in 1925 it was okay to use such terms as “Indian Skin” and “Mulatto”. Sometimes when I feel discouraged about the lack of progress in our own society, I can always look to the past to see that in some areas, at least, improvement has been made. 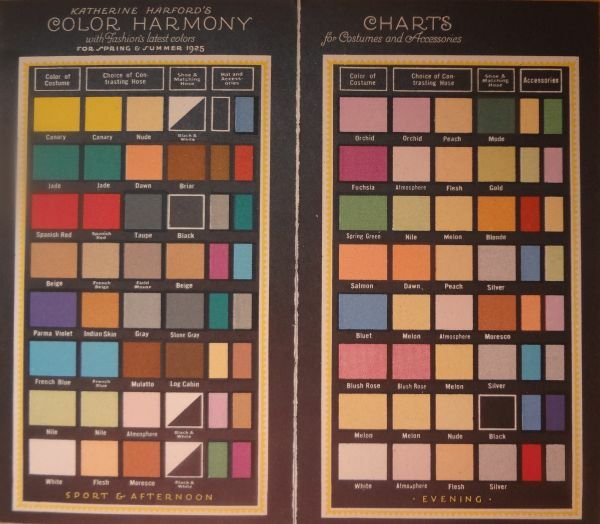 But societal issues aside, we can see on this chart some of the best and most popular colors of the mid 1920s. 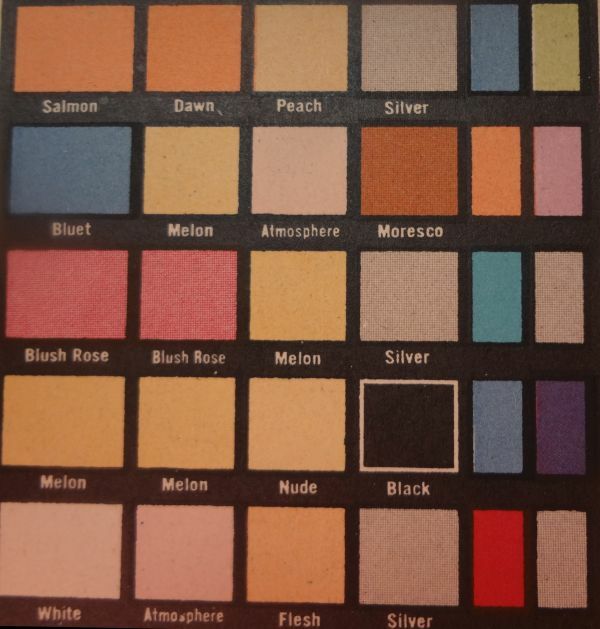 Salmon, of course, as orange was so much in favor, but also Bluet, Blush Rose, and Melon. I find it interesting that black is not in the evening costume category, as it had really gained in favor. 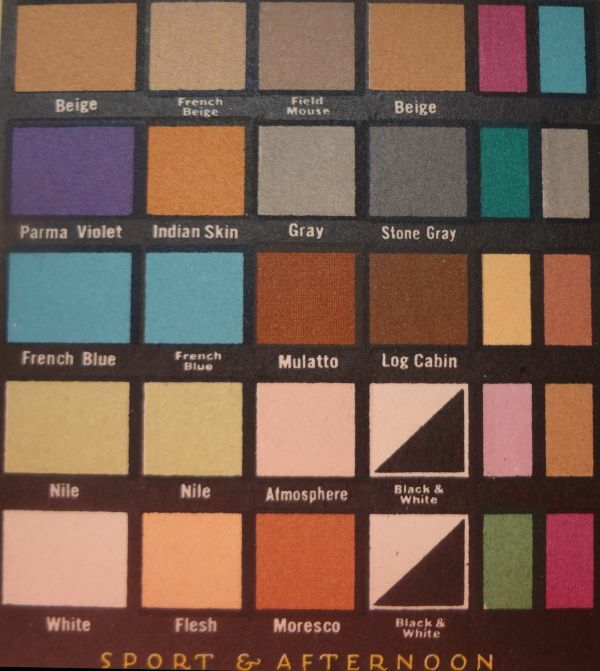 I look for old color charts, and buy any that are dated and reasonably priced. 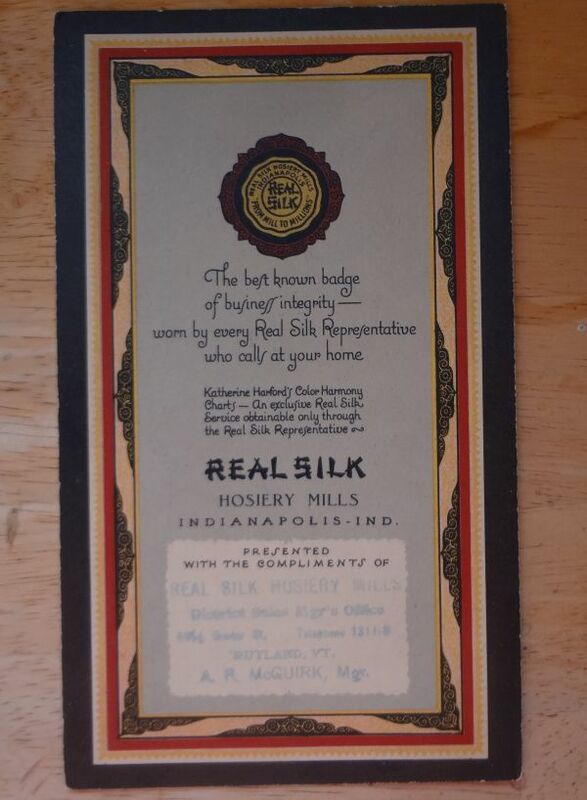 Thread and needlework companies also did color charts, but I’ve found they are rarely dated. Maybe they didn’t change the colors so often, as needlework requires a large range of colors, many of them not of the mode.